When did you get your first arms and armour collection piece? I'm an old-timer: more than 20 years ago! This update marks our 12 year anniversary. We officially launched on August 25th, 2003. Our thanks goes out to all of the wonderful members who have made this community so strong. And please visit us on Facebook where we share more content on a regular basis. Nice to see some new content. The Davis Reproductions stuff looks great. Nice to have links to their Facebook. Too bad their web domain has expired and their site is down (at least that's what comes back for me). I agree it's nice to see content flowing again. Remember when we used to publish every two weeks? While regular, scheduled updates are hard to do with everyone's personal workloads, I think it would be great to get back to more frequent updates. Josh's stuff is great. I do hope he resolves the domain issue soon. He's quite talented and a web presence will be great to have. I agree it's nice to see content flowing again. Remember when we used to publish every two weeks? The first year saw updates every week and then it was every two weeks for years and years. That's 678 pages in 12 years, or an average of almost 57 pieces of content per year. Wow Chad, you should take a bow for single-handedly keeping these excellent articles going. I've followed most of your recent collecting, but there are some here I haven't seen. All beautiful pieces. Nathan of course should also take a bow for keeping myArmoury going and having such a clean vision for reviews like this to have such great content. Nice poll question by the way. I don't think of myself often as an old-timer, but it's true, my first piece was an A&A dagger from a ren faire 20 years ago. I still have the second one I bought the following year. I started visiting the features and collections pages here 13 years ago but did not venture into the forums until more recently. I'm glad I have done so. I love the Notation Knife, what a unique piece. Congrats on twelve years! Thanks, Patrick! It combines my passion for music with my passion for period edged things. The whole idea of hymnal cutlery is just too odd to not pursue. Lots of folks (you included) have helped greatly through these dozen years. It's the community aspect that I really enjoy. Congratulations to myArmoury as well as to Nathan and Chad for keeping this place going. Thank you to them as well as to all of those here who have helped me along my meandering journey in and out of this hobby. Well, if the turnshoe fits! Congratulations and well done gentleman. When I saw it I immediately thought, "That has Chad written all over it." Happy 12 Year Anniversary to us! Could be, might want to have that translated. I might have done it that way if it were mine. 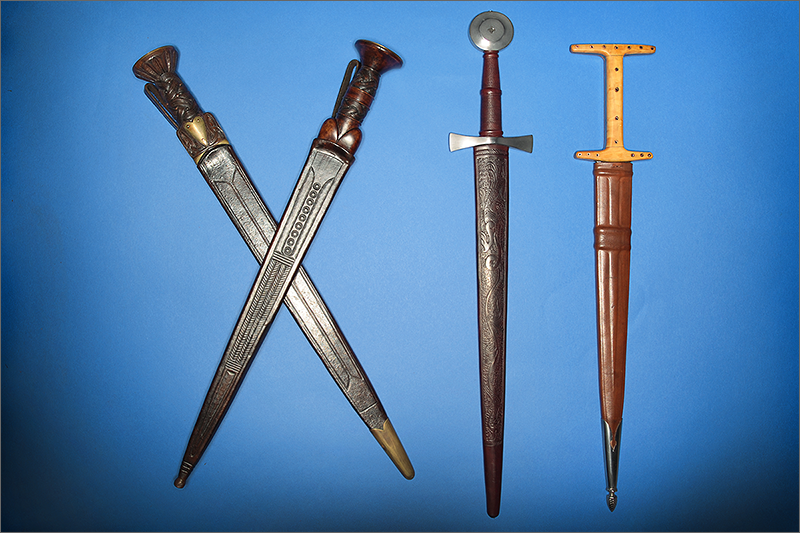 I used the V&A's translation and my own limited knowledge of Latin on the blade inscriptions. I do know what it says, I was just making a bad joke. Chad some nice additions to your collection and about some things I didn't even know existed like the " Notation Knives ". I guess people needed to make their own entertainment and part of the thanks of a supper guest would be in song. A funny thought: Young people today, if they have never read or seen any accurate history programs, probably think that the Internet always existed and that after a supper in medieval times people would retire to the T.V. room to watch DVDs or Medieval NETFLIX .... razz. Probably even WWII or WWI history are a total mystery to many young people ? Oh, back on Topic: I visited the Met. early in the 1970s and the arms collection seemed to be very good in those days, I wonder if it's better today in quantity and/or quality. Many of the things at the Met. are in many of my older reference books. The Ballock Dagger looks very good. and I also like the war hammer a great deal: Do the steel hammer and the steel spike also have reduced sized tangs going into the mass of the bronze or are they brazed along flat to flat surfaces steel to bronze? If I was designing such a hammer they would have some sort of steel extension into the bronze.